I am known as Bambi, the yellow acara. I am fairly new to neopia and still a young child. Being so, I am very playful and appear to be quite naive. I am not careless however. I know very well the dangers that lurk in the unknown shadows of Neopia. It's just that being young is a one time thing and I want to enjoy my youth while I can. My older sister, Kenedy, says its the best time there ever is in your life. I look up to my sister, for she is very wise. Someday, I hope to be as smart as her. Since I am a hard worker and believe that I am capable of leading a good life, I think my goal is not far out of reach. I enjoy doing many things. Many people describe me as a "bottomless pit" when it comes to eating. I can't help that though, because I do alot of exploring and therefore require larger meals. I'm completely a vegetarian and my favorite thing to snack on is a red apple. Yum. I enjoy company very much. I like to be around different species in Neopia. I think it's a great experience to be able to communicate with people different then myself. It's true, I am a social ladybug, but I also like being by myself. It's what I call "thinking time" and I make sure to include it in my day. Often, I go into the deepest woods of Neopia and explore the unknown territory. It's so relaxing, to hear only the sounds of birds and a nearby running stream cascade down a mountain side. I think positively of myself. I believe strongly that it does not matter what someone looks like on the outside. It's whats on the inside that counts and matters. My goals in life are many. I really want to continue studying the different cultures of Neopia. 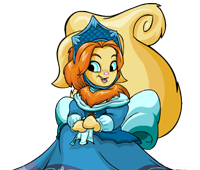 I think I will gain much wisdom from this, and, perhaps the dis-ease between some of the neopets will cease with my help. I also wish to continue to become a better person. There is always room for improvement. No one is perfect and no one will ever be perfect, but it's always good to be a positive role model and do the best in life. I will need to be a good role model because soon I will be getting a new baby brother. I want to be a good older sister, just as Kenedy was and continues to be for me. I will be honored to recieve the award for the "Pet SpotLight", but I will not be sad or disappointed if I do not receive it. I think whoever gets this award deserves it, and for that reason alone I would be happy for who ever gets the honor of having it. I part you with the following words; Never give up on what you dream and believe. I think, more than anything, that your dreams can help you through all the obstacles of life to achieve your goals. Never let anyone take away your dreams, and never ever give up. Thank you so much.